Air pollution around the Port of Los Angeles improved in 2013, continuing a trend seen over the last eight years, city officials said Monday. Harbor officials credited cleaner-burning trucks and speed restrictions on cargo ships for helping reduce emissions last year. The port’s 2013 Inventory of Air Emissions — which annually tracks pollution from ships, trucks, trains, cargo-handling equipment and other mobile sources — found diesel particulate levels dropped 7 percent in 2013 compared with 2012, which is an 80 percent drop since 2005. Nitrogen oxide levels were down 7 percent, a 57 percent drop from eight years ago, and sulfur oxides fell 8 percent, contributing to a 90 percent reduction since 2005. 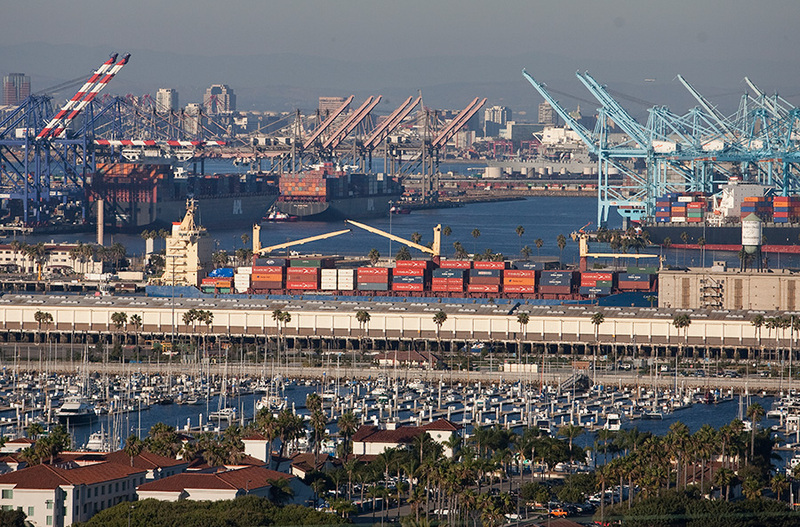 Greenhouse gases were down by 8 percent compared with 2012, and by 23 percent since the adoption of the San Pedro Bay Ports Clean Air Action Plan in 2006, officials said.